The sign on the street outside Tempura Yokota and the elevator up to the restaurant are as modern as they come. But the patinated sliding wooden door that greets you on arrival speaks of tradition and, once you’re inside, so does the welcome. 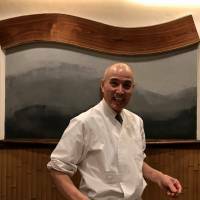 Chef Tsuneo Yokota has been plying his trade in Azabu-Juban since 1980, and during that time he has seen big changes in the neighborhood — not least his own move into new premises some eight years ago. Through it all, his intimate restaurant has retained an old-school, local feel. Yokota is 66 but shows no signs of slowing down. Each morning he gets up early and heads down to the central market in Tsukiji to pick up fresh seafood and vegetables for the day. And every evening he transforms them into some of the tastiest tempura in Tokyo. Unusually, his standard omakase (chef’s special) menu starts out with a simple green salad, just enough to wake up your appetite and taste buds and to occupy you while the condiments are prepared: grated daikon to go in the soy-based tsuyu (sauce), cruets of salt and curry powder, and wedges of fresh lemon to be squeezed into a saucer as a separate dip. 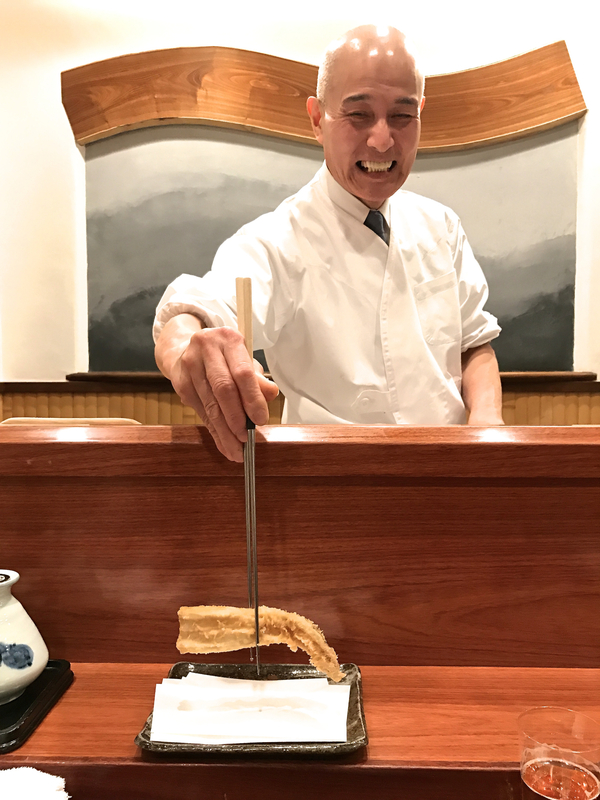 Throughout the meal, Yokota will suggest the condiment that best matches each piece of tempura. The opening item is always kuruma ebi (king prawn). However, Yokota presents you with the legs first, encased in delicate, crunchy batter, followed by the juicy, tender body of the prawn. 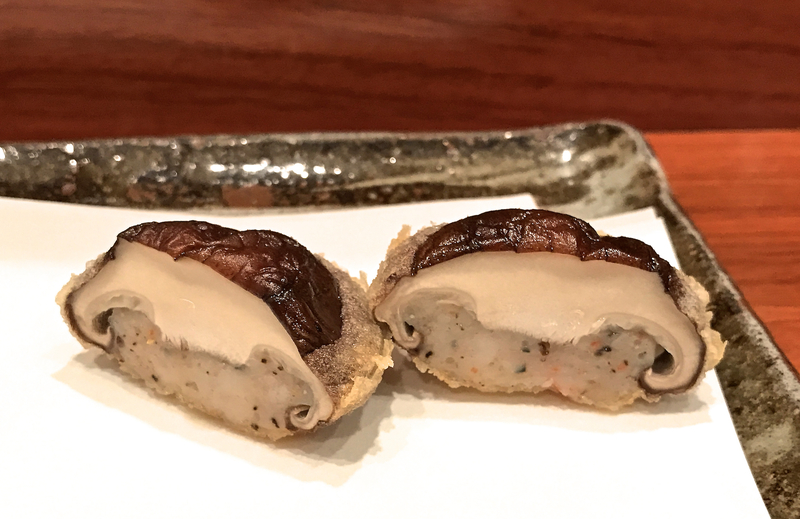 All the classic ingredients are present and correct, from kisu (Japanese whiting) and plump, juicy scallops to fresh shiitake mushrooms stuffed with shrimp paste and delicate little eggplants sliced in two lengthwise. Yokota serves the morsels piece by piece, always making sure he places them on a fresh piece of absorbent white paper in front of each diner. 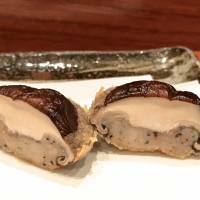 At this time of year you can expect bamboo shoot, hinting at the spring that is around the corner, as well as little skewers of ginkgo nuts from the autumn that is now well behind us. And whatever the season, there will be anago (conger eel). This is one of his classic preparations, with a superb contrast of textures between the crisp batter and soft white flesh. 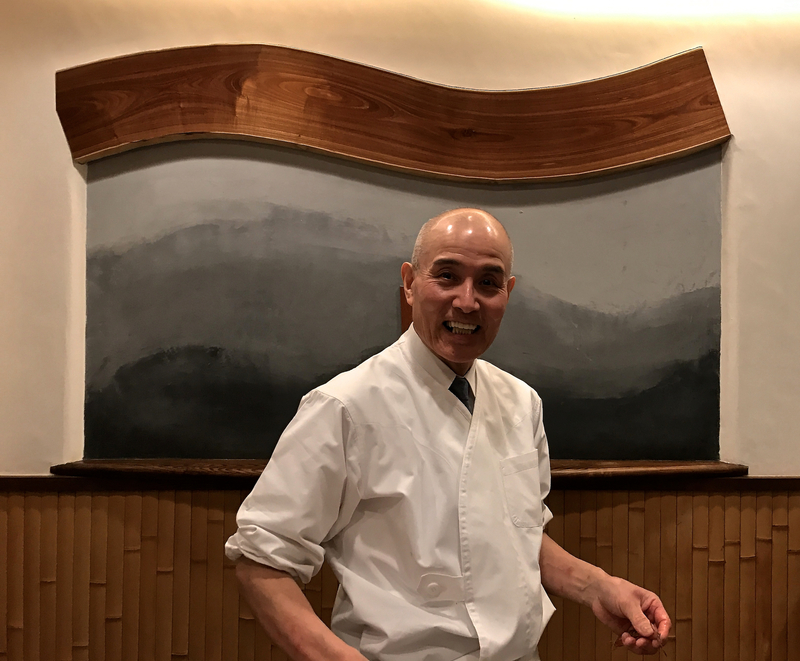 After serving one more prawn, Yokota asks if you’d like a repeat of any of the seafood — the whiting and the eel are definitely just as good the second time around — before moving on to the final course. In the long-established tempura tradition, this is always rice with kaki-age, a rich, golden, deep-fried patty of shrimp, either as a donburi rice bowl or drenched with tea as chazuke. Finally, to round things off, you adjourn to a small side chamber for a light dessert of ice cream. 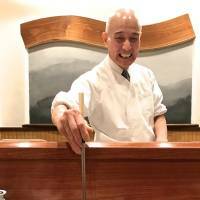 Yokota doesn’t claim to be in the same league as the high-end tempura houses with their deluxe ingredients and substantial wine cellars. 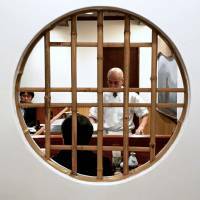 But what has made his restaurant so enduringly popular is the relaxed atmosphere and the warmth of his character. Above all, it is this personal touch that continues to draw back customers new and old. Long may he run. Patio Azabu-Juban 3F, 3-11-3 Moto-Azabu, Minato-ku, Tokyo; 03-3408-4238; open 5:30-8 p.m. (L.O. 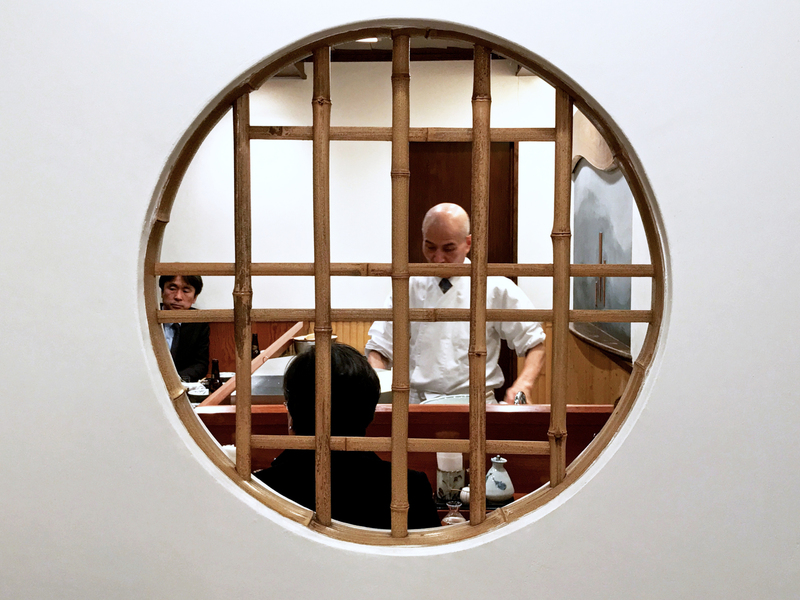 ), closed Wed.; set menu from ¥10,800; nearest station: Azabu-Juban; no smoking; cash only; no menu; a little English spoken. Robbie Swinnerton blogs at www.tokyofoodfile.com.